- Name equivalent fractions based on interpreting a fraction model. - Name equivalent fractions based on interpreting a numerical fraction in standard form. 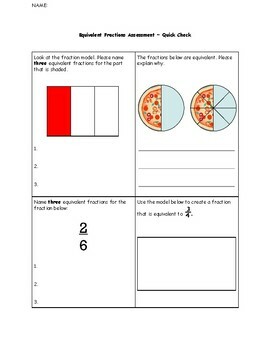 - Explain why two fractions are equivalent based on interpreting a real world fraction model (pizza). - Create an equivalent fraction model based on a presented numerical fraction in standard form. This assessment is a great reference to utilize as a quick check or formative assessment. Works well for multiple grade and ability levels.